Time to add another name to the tablet fray, as Australian based Pioneer Computers has announced their newest tablet- the DreamBook ePad F10. 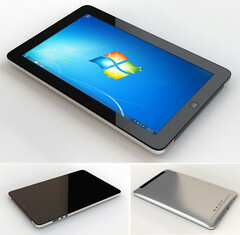 While the ePad looks eerily similar to the iPad (as most tablets tend to do), it is one of the few tablets powered by Intel’s Atom processor. The F10 features an Intel Atom Oak Trail Z670 Processor clocked at 1.5 GHz, Up to 2GB of DDR2 memory, Wi-Fi, 3G, a 1.3MP camera and optional Bluetooth. The 10.1” display features a resolution of 1024x600 pixels and Pioneer claims the tablet will have up to 8 hours of battery life. What’s interesting about the DreamBook is that it offers the user the choice between Windows 7 and Android OS, which should give users an amount of flexibility when purchasing the tablet. As far as pricing goes, the ePad F10 will start off from $499 for the 1GB RAM and 16GB SSD version. However, the price climbs up to $896 if you include 2GB of memory and the 64GB SSD. Now while Pioneer is listing 128GB as the highest storage available for the ePad, that option is not found currently when customizing the tablet. That should change soon, but it could also bump the tablets price into 4 digits. For those interested, pre-orders have already begun and you can customize your own on Pioneer’s website with shipping later this month. However, while the freedom to choose your OS is interesting, the tablet doesn’t seem to offer much more than what’s currently available on the market.